The forms fields needs to be more responsive (NXP-14966). They now have a 100% width behavior by default. 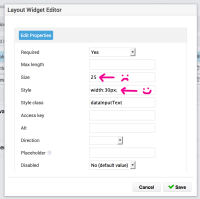 The size value should be add in styles as width, not with the size attribute.